Samoa is the ultimate paradise island full of tropical wonders and luckily remains relatively untouched. Head off to explore the Pacific gem before it gets too crowded, and be sure to include these places on your itinerary. Samoa, a nation made up of two main islands in the Pacific Ocean, is the definition of a tropical escape. The destinations are gorgeous, the people are sweet and the vibe is chilled. Under 130,000 people visit the small island nation each year, as opposed to the almost 800,000 who jet off to Fiji. So, if you’re the type of person who likes a little more room around you on the beach, an incredibly local experience in a diner and pure peace and quite everywhere you go, then Samoa is for you. But get in quick, because the islands are only getting busier! 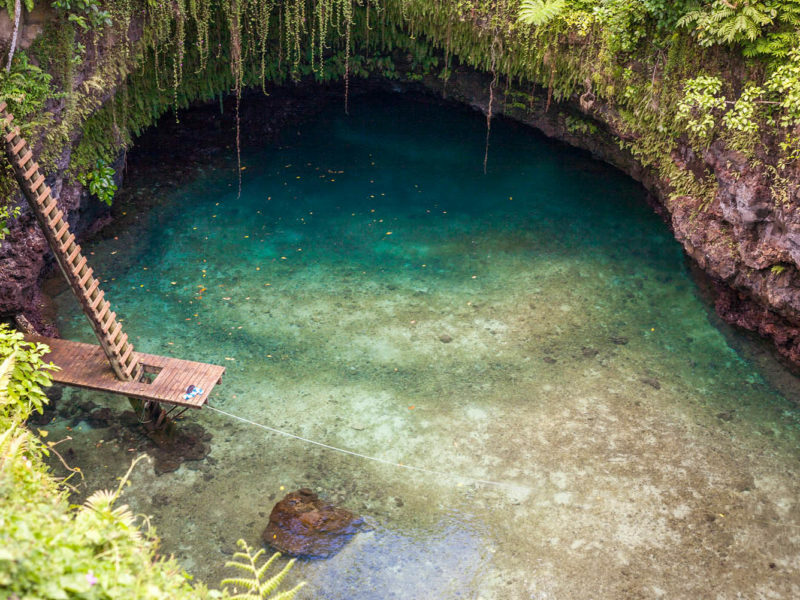 Living up to its tropical nature, Samoa is full of spectacular waterfalls that provide for the most refreshing mid-day dips. Along with Togitogiga, Afu Aau is one of the most popular dipping destinations on the islands, and rightly so. The spring water is so clear and crisp that it will probably be a minute or two before you immerse yourself fully, but once you do, you’ll float in it for hours. You’ll be stopped at a fale (thatched hut) on the dirt road leading to the waterfall and asked to pay the $5 tala (approximately $2.50) fee. Samoans put strong value in religion and family. Located in Safotu village, Sacred Heart is one of the largest churches on the island of Savai’i that also serves as a school. Its vibrant nature is exactly that of the beautiful Samoan people. There is no entry fee to have a look around but note that during school hours you aren’t able to enter the grounds. Among many things, one great aspect of travelling around the island of Savai’i is that there is a very low chance you’ll ever get lost. There is only one main road that gets you around the island and all your pit stops are along this road. Once you start to reach the western tip of Savai’i, your route escapes into thick, luscious rainforest that truly ignites your visual senses. Along the road you’ll pass the Se’eti Beach Fales which are a must-pit-stop for a quick dip and tan, before you jump back and continue along the incredible route. If you fall in love with the pit stop however, don’t worry you can actually stay in the fales overnight! Ever wanted to take a dip in a rock pool without having fifty people chatting and splashing around you? The Lefagaoali’i village pools in Savai’i are the perfect park spot for uninterrupted views of the Pacific Ocean. They are like no other rock pools you’ve ever experienced and much of the time, they’ll be all yours to enjoy! Entry is $10 tala per vehicle and $2 tala per person for a dip. Just note there are separate female and male pools. A long, open stretch of soft sand on the coast of the Pacific, with not a soul in sight? Yes please! Aganoa Black Sand Beach tickles your curiosity and doesn’t disappoint once you arrive. The sand is really black and the beach is really magnificent. The best bit though; in the late afternoon you’ll usually get the whole beach to yourself. You’ll be greeted by villagers under a fale at the start of the dirt road that leads to the beach. Entry fee is $10 tala per vehicle. There are no words to describe this wonder of the world. 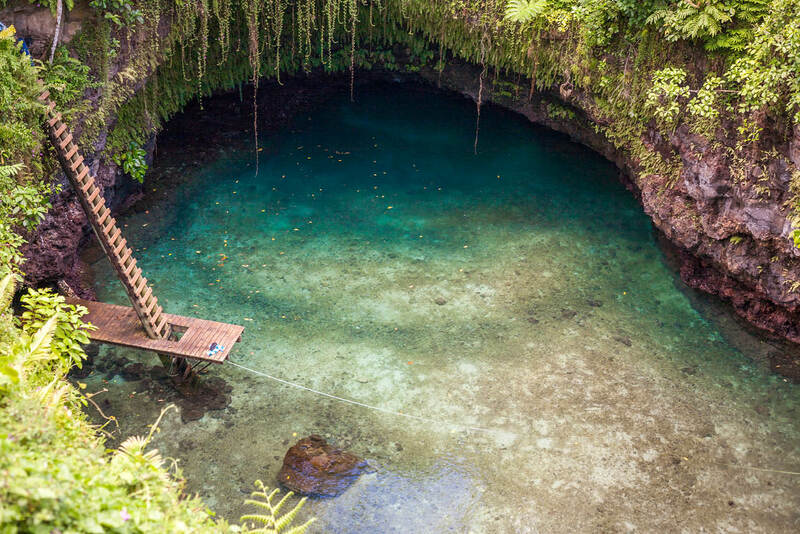 Tu Sua Ocean Trench is quickly starting to make waves in the world of Instagram, and rightly so. Once you build up the courage to climb down the wooden ladder on the side of the trench, you’ll never want to leave this place. Make sure you get there early to avoid a crowd and get a good photo. Entry is $20 tala per person and it is so damn worth it!